If you're investing a serious amount of cash in a laptop that's going to last you several years, you want to make the right choice. The good news is you've got some excellent computers to choose from – the bad news is it's not always easy to pick out the right one. That's where come in. Here we'll weigh up the various pros and cons of three of the best laptops on the market today: the Dell XPS 13, the Surface Book 2, and the MacBook Pro. These are all very decent picks for your next laptop, but which one is right for you? 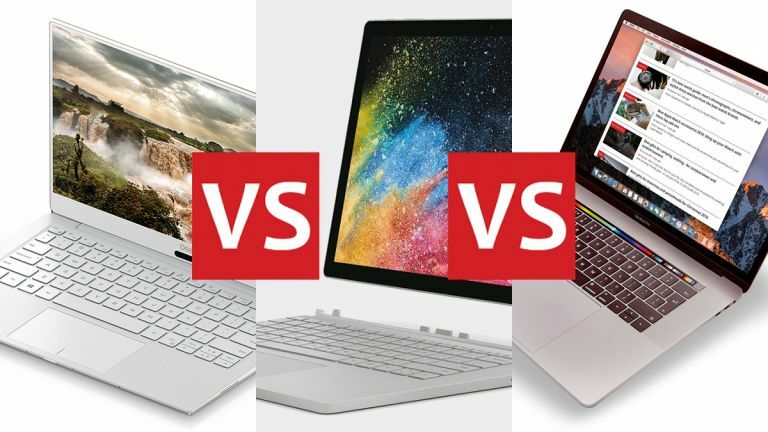 Top marks for design all round, though these laptops all have their own distinctive style, too – the classic ultrabook look of the Dell XPS 13, the classic Apple look of the MacBook Pro, and the not-so-classic Microsoft look of the Surface Book 2, with that distinctive middle hinge still present and correct. If you want a laptop that turns into a tablet with a detachable display, then the Surface Book 2 is the obvious choice. The Dell and Apple laptops don't have detachable displays, but the XPS 13 has an optional touchscreen, and the MacBook Pro has a Touch Bar on some models, offering shortcut keys for some applications and Touch ID access. As the name suggests, the Dell XPS 13 is available with a 13.3-inch display: you can pick from a 1920 x 1080 pixel or a 3840 x 2160 pixel resolution on the Dell website (depending on your region). The 13.5-inch Surface Book 2 has a resolution of 3000 x 2000 pixels, and the 13.3-inch MacBook Pro offers a 2560 x 1600 pixel resolution. You can get all three laptops in a larger, 15-inch size if you value screen space over portability (though in the case of the Dell you'd be looking at the XPS 15 rather than the XPS 13 of course). Speaking of portability, the Dell XPS 13 is definitely the winner, coming in at 1.21 kg (2.67 lbs) rather than 1.37 kg (3.02 pounds) for the MacBook Pro and 1.53 kg (3.38 lbs) for the Surface Book 2. So many different configurations of these laptops are available from Dell, Microsoft and Apple that listing them all here would get very complicated – instead we'll give you some edited highlights from the 13.x-inch line-ups. You can fit out all of these laptops with top-of-the-line Intel i7 or i5 processors, so there's not much to choose between them in terms of raw horsepower. Both the Dell and Microsoft laptops offer 8GB or 16GB of RAM, whereas the Apple computer maxes out at 8GB, unless you go up to the 15.4-inch size. As for storage, the top limits are 512GB for the Dell XPS 13, 1TB for the Microsoft Surface Book 2, and 512GB for the Apple MacBook Pro, at least as far as the 13.x-inch models go – we're focusing on the smaller sizes to keep our comparison as simple as possible, but generally speaking you can get better specs at the bigger size in all three of these ranges. Finally graphics: the Dell and Apple laptops are pretty much equal in terms of the choice of on-board Intel graphics you get, but the Microsoft computer offers a more powerful Nvidia GeForce GTX 1050 GPU. The Microsoft option certainly gets you closest to desktop levels of power, but you'll have to pay for it. A lot of the differing features here are determined by the on-board operating system and the form factor of the devices. Thanks to the 2-in-1 design of the Surface Book 2, it's the most flexible here, letting you set it up in a tent shape or detach the screen entirely, as we've already mentioned. The Dell XPS 13 and MacBook Pro are more conventional laptops – you can't suddenly turn them into digital drawing pads or anything like that, but on the plus side they are lighter to carry around, and still do everything you need from a laptop. Your preference for Windows 10 or macOS High Sierra may well inform your choice here as well. While we don't have room for a full comparison here, we have written about the differences between them before – a lot of it comes down to your personal tastes and the other devices you want to use your laptop with (macOS is the obvious choice for people who already have a lot of other Apple kit). Think about ports and expandability, too: the Surface Book 2 and Dell XPS 13 pack in three USB-A/Thunderbolt ports, one USB-C port, a memory card slot, and a 3.5mm headphone jack. In comparison, the MacBook Pro offers four USB‑C ports and a 3.5mm headphone jack, but no memory card slot. As we said at the start, these are all great laptops – you won't be disappointed whichever one you end up buying. We're not talking about major differences here, and if you check out the deal links on this page, you can use the latest prices for all these devices to help you make a decision. We like the Dell XPS 13 a lot for its lightness and its portability – especially with the 4K screen and minimal bezels, which look gorgeous in combination. It's deceptively powerful, too, though it's not cheap, especially at the top configurations. The Surface Book 2 is going to appeal for those who want to jump between tablet and laptop modes, thanks to the flexibility of Windows 10. On paper it's also the most powerful of these machines, and so is a suitable choice for some mobile gaming. Just make sure you're not buying power you don't need. Then there's the MacBook Pro, perhaps lacking some of the features and grunt of its rivals but perfect for Apple fans. If you've got some serious computing to do and prefer Apple software above anything else, then it's a superb choice. Set your budget, weigh up your options, and you've got years of enjoyable laptop use ahead of you.